Abstract: Recent media attention in March 2018 has highlighted the growing number of emergency department (ED) attendances following trampoline park injuries. Over the past four years, the number of parks in the UK has increased from three to about two hundred and in 2017, ambulances were called out to 1,181 incidents at trampoline parks across England . A national database in the USA showed that approximately one third of ED visits for trampolining injuries resulted in fractures, occasionally serious life-threatening injuries, and constituted a significant expense to emergency departments . 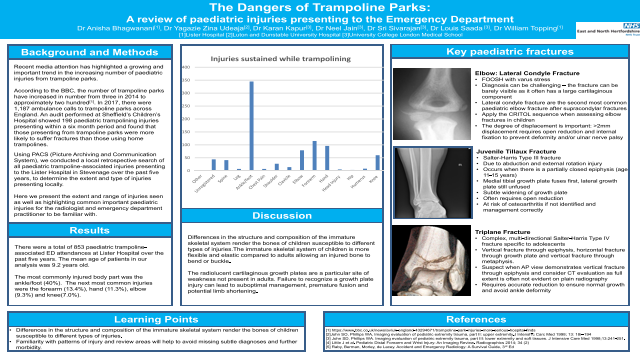 Given the significant rise in such accidents, we have conducted a search of trampoline-related injuries at our institution and present the most common and serious injuries, their imaging features and related complications that are important for both the emergency department practitioner and radiologist to be familiar with. Summary: Recent media attention has highlighted a growing and important trend in the increasing number of paediatric injuries from trampoline parks.